Michael Desmond’s Under One Sky solo exhibition captures faces and souls from around the world. These photographed individuals are old and young, some praying and others playing. Most of the photographs were taken in various parts of India and Africa. Two were taken in Panama and one was taken in Desmond’s hometown of Los Angeles. His travel shots included landscape as well, but Desmond selectively narrowed down the thousands and thousands of images to the ones with human subjects for Under One Sky. Michael explained that he chose to focus this exhibit on people rather than landscape because it was about finding a piece of himself in each person that he encountered on his travels. Desmond began having an interest in photography as a child. There is a picture at the beginning of the exhibit, along with his biography, of a very young Desmond standing in front of a large camera. Photography remained a hobby of Desmond’s for years until he finally decided to take it further. Upon beginning his career, Desmond was mentored by Bill Santos, Dean Tokuno and Richard Foreman (Terminator Salvation, No Country for Old Men). He is now part of the Cinematography Guild and does unit photography, having shot on the sets of popular television shows such as the Showtime drama Weeds, Grey’s Anatomy on ABC, and the CW’s 90210. Desmond also does portrait, beauty and advertising photography. His work for this exhibit, however, is very different than being on a Hollywood set with A-list actors. It is personal and almost all of the shots are candid, capturing people — villagers, children, a monk — in authentic moments. Desmond explained that it had always been a dream of his to go to Africa, and that “Geisha Tree,” photographed in Kenya, Africa, is one of his favorites. 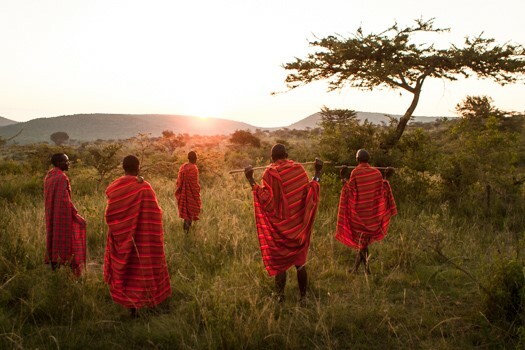 It shows not only a geisha tree but five Masai Mara villagers in bright red garb looking to the sunset in the horizon. Desmond described getting down into the grass to capture this unexpected and picturesque moment. Another one of his favorites is “Monk on the Bus,” photographed in Bangkok, Thailand. The bus and most of its passengers appear to be in motion, but there is a monk near the front in clear focus, with an intense expression on his face. “Old Man,” shot in Vrindavan, India, is a close-up of a weathered man Desmond encountered on a spiritual trail — a man Desmond described as appearing to be God himself. He has thick, long white hair and a white mustache that blends into his long white beard. “Three Kids on the River” is a silhouette shot taken by the Yamuna River in India. Desmond explained that he got lucky with the photo, because right after he had taken it, the children got up and left. He felt he had captured a very fleeting and beautiful moment. 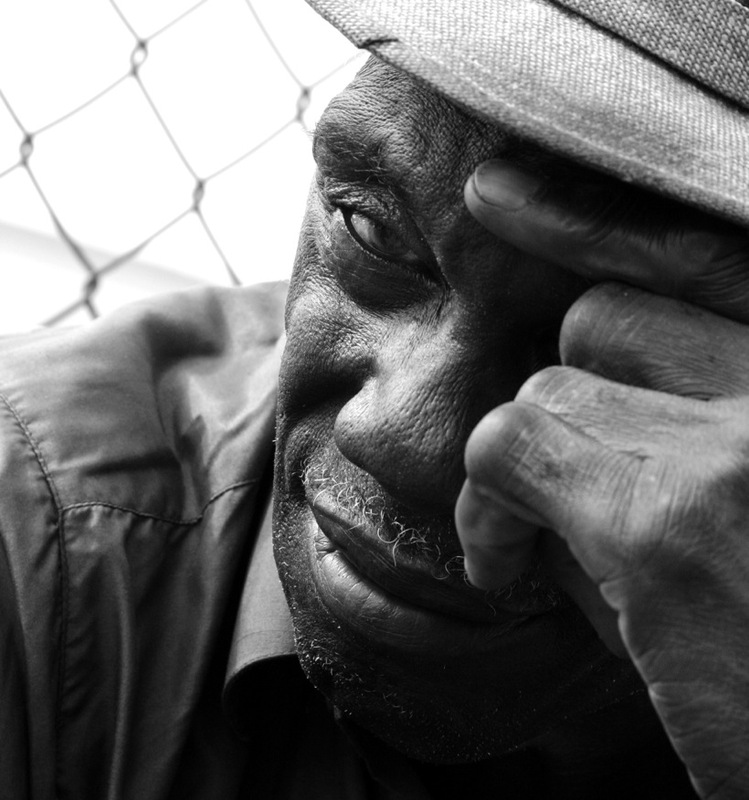 Unlike the rest of the photographs taken outside of the country, “Old Man with Hat” was taken in Desmond’s hometown of Los Angeles. It is a close-up of a man wearing a hat against a fence. Desmond expressed that the man was camera shy, but felt that he was able to capture a striking moment when he took the picture. The common thread between all of the photos is that they encapsulate moments that are genuine and personal albeit across many different countries and continents. Desmond believes that those viewing his work — no matter where they are from — will be able to find some connection to the faces they see in his exhibit. He emphasized that what reflects will be different for everybody based on his or her own filter; it’s about viewers finding a part of themselves in each photograph. Other works include “Children Playing,” shot in Agra, India; “Girl at Car Window,” shot in Agra India; “Old Woman,” shot in Vrindavan, India; “Two Kids & Buckets,” shot in Vrindavan, India; “Couple in Window” shot in Casco Viejo, Panama; “Man & Red Door,” shot in Casco Viejo, Panama; “Masai Portrait,” shot in Kenya, Africa; “Masai Mara,” shot in Kenya, Africa; “Boy Praying,” shot in Rishikesh, India; “Woman Sewing,” shot in Kibera, Africa; and “Man in Temple,” shot in New Delhi, India. This exhibition takes place at the Edgemar Center for the Arts, located at 2347 Main St., Santa Monica, CA 90405. It runs through November 2014. Visit http://www.edgemarcenter.org for more information and www.desmondphoto.com to learn more about Michael Desmond.